So I recently realized that in all of my travels to beaches, historic landmarks, sprawling countrysides and urban cities I still have yet to go skiing! Considering I live next door to Wisconsin which has plenty of ski resorts and the fact that I have friends in the Denver area this is pretty pathetic lol. Last year I came close to planning a ski trip with one of my male BFF's but we waited until the last minute and didn't have our stuff together! 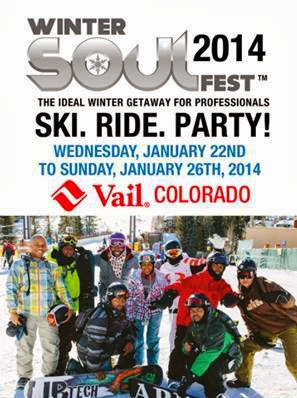 So when I got the details about the upcoming Winter Soul Fest I got excited all over again!